Learning about men’s 1940s fashion history is a big help in creating vintage looks for a swing dance or WW2 history event yet questions still come up about how to put an entire look together. The hardest part about finding 1940s men’s clothing besides vintage clothing being to small is finding wide cut suits and pants in today’s world of “slim fit” and “skinny” everything. For years my secret source has been “urban menswear” shops hidden in inner city areas of town. These shops carry a lot of Italian, Latin-American, and African-American designer fashions that still favor a wide fit. Online the choices are few and far between. Luckily I found a company, MensItaly, that carry a good selection of suits, pants and accessories ideal for creating vintage-inspired1940s men’s outfits and costumes looks. MensItaly has sponsored this month’s article. Let’s take a look at some of their clothing and see how easy it is to create 1940s menswear looks with them. The next look exchanges the formal business suit for a slightly more casual sport coat. Sport coats and trousers were often paired together in the same color family but contrasting prints. In the example below a blue plaid sport coat was worn with plain blue trousers. Otherwise, check, herringbone, windowpane or pinstripes trousers were mixed with solid sport coats. Shades of brown and shades of blue were the most common semi-casual looks. Accessories were more relaxed as well. A fedora hat could still be worn but wasn’t necessary. Contrasting brown leather belts and two tone brown and white or black and white shoes added to the semi casual style. A white dress shirt made the perfect backdrop for a bold splash of color with a striped necktie. However, a white pocket square was still worn in the breast pocket. The time for matching tie and pocket square was not ready to reappear in fashion just yet. Taking casual to the next level means forgoing a suit or sport coat altogether. The dress shirt also disappears and in its place is an open collar sport shirt in a solid color or big pattern. Sport shirts often had two large patch chest pockets, although a single pocket was possible. These types of shirts are not very common in our modern wardrobes. The closest match is usually a camp shirt or lounge shirt seen in summer fashion. MensItaly however has some great open collar shirts sold with matching dress pants for what they call a “casual walking suit.” The shirts are wide fitting with large collars perfect for a 1940s look. The matching wide leg pants are great to have as well although most casual men’s 1940s looks did not come in matching sets. Save the pants for another outfit and instead pick up a second pair of high-waist wide leg pleated trousers in the same color family as the shirt. Accessorize the casual look with a brown leather belt. Textured belts in alternative leather like ostrich, alligator or embossed scrap leather were necessary during the war years when good cowhide was rare. They were cheaper back then but quite expensive today. MensItaly has some nice high end options. A note about suspenders. Some men continued to wear button on striped elastic suspenders in the early 1940s but overall they were out of fashion. Belts were in style and more comfortable to wear. The choice is yours. Finally brown and white two tone shoes return for this casual look. Solid brown oxfords could also be worn. Black looked best as a formal and semi-formal shoe options, brown was best for casual styles. The iconic Zoot Suit associated with rebellious inner city youth and bootlegging gangsters is a favorite 1940s mens style to dress in. The oversized suit jacket in large stripes and bright colors paired with wide and often peg legged pants for an exaggerated ’40s fashion statement. The Zoot Suit could be worn with a plain dress shirt or open collar sport shirt with or without a neck tie. Neckties could be flashy and wide, long and very skinny, or an oversized bow tie. There were few rules to Zoot fashion other then to be the opposite of what classy men were wearing. Suspenders or belts. A long single or double gold chain. Solid or two tone shoes. You can mix and match to your hearts content with Zoot fashion. Mens Italy makes is very easy to find modern Zoot Suits and almost all the accessories. 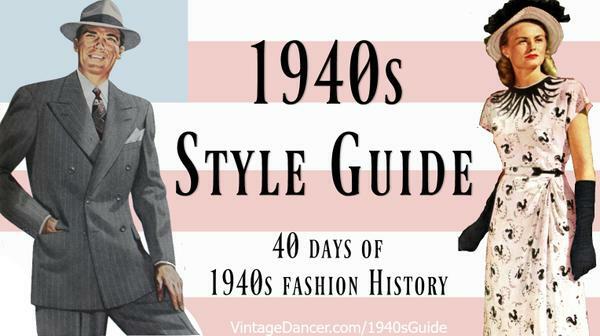 Create the above 1940s men’s outfit ideas with this article. Sign up to receive the free 1940s Style Guide series via email. 40 articles about women’s and men’s 1940s fashion history will be emailed to you over the next two months. I’m enjoying your website so much! I’m a classic movie fan, and I love the 30s, 40s, and 50s styles! I met my fiancé at a square dancing convention in June, and we are planning a 1940s themed wedding, so I’m consulting your pages as fashion reference. Thank you! I wonder if you’ve considered a page on the square dance fashions of the hugely popular activity during this era? It’s a vanishing art, and my fiancé and I are coming on board as the aging square dancing generation is hanging up their dance shoes. We hope to be a part of keeping it alive…. That would be a very interesting topic but also one that is quite tricky to research. I’ll add it to my list….